This place is AWESOME! 5 pools, a dozen restaurants, clean, beautiful, awesome in every way, shape and form!!! Great staff, I can’t say enough good things about this place!! This is the one hotel in Dubai that just gets everything right. Well done to all the team and staff. Staff was wonderful. Hotel was beautiful. Bathroom was a bit dated but still nice. The staff goes above and beyond to take care of you. I arrived at the hotel past midnight and had to leave early at 7 am. The staff was extremely courteous and friendly. Luckily, I received an upgrade to Le Meridien Club. The hotel room was impeccably clean and modern! There was a nice outdoor, private patio. I slept well for the brief hours I was there. I would highly recommend a stay at Le Meridien Club if you are looking for convenient access to DXB. 15 mins from the city, 5 mins from the airport. Pleasant conference, restaurants were nice and bars were good. Currently going renovations, otherwise older quality style property. Rooms are dated, but are undergoing renovation. Good value. Restaurants are higher cost. Great place to stay with Awesome staff. but a little expensive in all reality. will certainly look at this hotel again but it will all depend on cost. Stayed here one night for business purposes and really liked the hotel. The staff are very friendly and courteous, the room was very comfortable and well equipped, and the food available at the hotel was excellent. The proximity to the airport and short ride to places like the Dubai Mall makes it a good location for business travelers such as myself. Overall a very good hotel and I highly recommend it. Love this hotel always try and stay here when im in dubai. very good location to dxb ternimal 1 (across the street). will stay there again on my way back home. I wanted a chance to relax and spoil myself before I got on another flight. The rooms are great, the staff was great, and there are plenty of restaurants and bars on site. It's a great place for an Expat to stay. I stayed at Le Meridian near the airport and i must say i was a bit hesitant to book it in the last minute. I was absolutely wrong in my underestimation. They were magnificent from the moment i stepped in till i checked out. I will never hesitate to stay there again and/or recommend it for any of my friends. A special thanks goes for "Neil" at the front desk who received me upon arrival, to "Ricoh" from the "Service" desk who was amazingly helpful as well, to the Room service who did an excellent job, and to the duty manager "Lorie Manuel" who was there when i checked out in a fraction of a minute. Simply thank you. Overall, the facilities are a little dated. That said, the staff's first class, and the amenities are generous. Frankly, I would opt for this combination, as opposed to a modern buildout with average staff. I stayed in the Royal/club rooms, and the package is value for money. Breakfast, tea service, happy hour, in room canapés, and it goes on. That said, tried the outlets...Jules, Seafood Market, the Japanese restaurant, and the Italian restaurant, and all were very expensive. Seafood Market was nothing short of exorbitant. The same concept in Asia would have been 1/5th the price. Observed sanitation issues at all the bars...namely, using the same hands on dirty glasses and clean glasses without washing. They lost my second course(appetizer), and forget to order the entree (45 minute arrival) at the Italian restaurant. Restaurant manager was gracious enough to offer dessert and comp the meal, but that's not the point, especially on our last night. To add insult to injury, noticed the chef came out to greet the locals, while ignoring everyone else, and then having a seat with a colleague/friend. So the rooms side gets an A+. F&B gets a C.
This hotel has kept my business since 2004. The staff is very friendly and helpful. There are numerous restaruants within walking distance where you can enjoy any type of food to your taste-buds. Overall, I would recommend this hotel to any traveler who desires a five-star hotel for an affordable price. Could not be better. After a two week trip I stayed one night and ordered room service. The meal was excellant, better then I was expecting. The room was very comfortable especially the extra large cushy pillows. 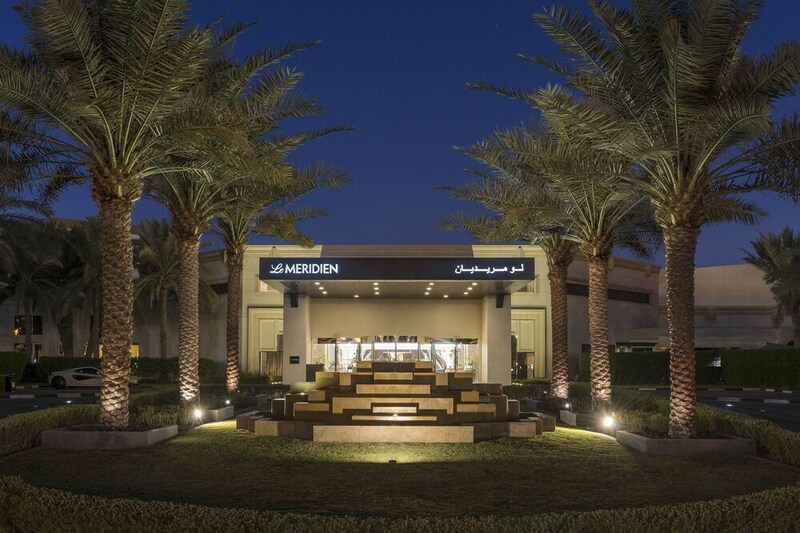 Located in Garhoud, Le Meridien Dubai Hotel & Conference Centre is within a few miles (5 km) of popular sights such as City Centre Deira and Dubai Creek. This 383-room, 5-star hotel has 5 outdoor pools along with a full-service spa and 15 restaurants. There are ample dining options with 15 onsite restaurants, including Yalumba , which specializes in international cuisine. Savor a meal from the privacy of your room with 24-hour room service, or get a pick-me-up at the coffee shop/café. For your convenience, a buffet breakfast is served for a fee each morning from 5:30 AM to 10:30 AM. An LCD TV comes with satellite channels, and guests can stay connected with free WiFi and wired Internet. Tempur-Pedic beds sport Frette Italian sheets and pillow menus, and the bathroom offers a soaking tub, a hair dryer, and designer toiletries. Other standard amenities include a minibar, a coffee maker, and free newspapers. Guests of Le Meridien Dubai Hotel & Conference Centre have access to a full-service spa, 5 outdoor pools, and a nightclub. Free valet and self parking are available, or if you're not driving, take the airport shuttle (available 24 hours) for AED 55 per person roundtrip. The 24-hour front desk has multilingual staff ready to assist with securing valuables, concierge services, and access to locker space. Other amenities at this luxury hotel include a children's pool, a health club, and a spa tub. late check-in with stellar service and room! Buffet breakfast is served daily from 5:30 AM to 10:30 AM for a fee. Yalumba - Poolside restaurant and bar specializing in international cuisine. Open daily for breakfast, brunch, lunch, and dinner. Reservations required. Warehouse - Pub. Open daily. The Dubliner's - Sports bar specializing in international cuisine. Open daily for brunch, breakfast, lunch, and dinner. Reservations required. Casa Mia - Fine-dining restaurant and bar specializing in Italian cuisine. Open daily for lunch and dinner. Reservations required. Sukhothai - Fine-dining restaurant and bar specializing in Thai cuisine. Open daily for lunch and dinner. Reservations required. The hotel has 5 outdoor swimming pools and a children's pool. A health club, a spa tub, and a sauna are other recreation options. The following credit cards are accepted: American Express, Diners Club, JCB International, Mastercard, and Visa. Guests must contact this property in advance to reserve cribs/infant beds, onsite parking, and access to the hot springs. Guests must contact this property in advance to reserve cribs/infant beds, onsite parking, and access to the hot springs.